Rice is hardly regarded as a special side dish, unless it gets fancied up as a risotto, joined to all sorts of goodies and a nice amount of butter. But, black rice, also known as Forbidden Rice, is another story. Dark, mysterious, with a heartier texture and more assertive flavor, it has the potential to make any meal special. I recently paired it with roasted cauliflower, and we were both very pleased with how it turned out. Soak the rice in plenty of cold water for 45 minutes. Drain, and rinse well. Add to a sauce pan with the water seasoned with salt. Bring to a boil, reduce heat, simmer with a tight-fitting lid for about 35 minutes, until the liquid is absorbed. Leave in the pan undisturbed for five minutes before serving. To roast the cauliflower, cut the florets in a way that they get a flat side. Mix them with 3 tablespoons of olive oil, season with salt and pepper, and place as a single layer in a baking sheet, covering tightly with aluminum foil. Roast at 450 F for 10 minutes, remove the foil, roast for 15 more minutes, flipping the pieces mid way through (or at least moving them around a little, so that new spots touch the bottom of the pan. Depending on how dark you like your cauliflower, let them roast longer. Meanwhile, mix the remaining tablespoon of olive oil with the lemon juice and spices. When the cauliflower is ready, drizzle the spice mixture, toss gently. 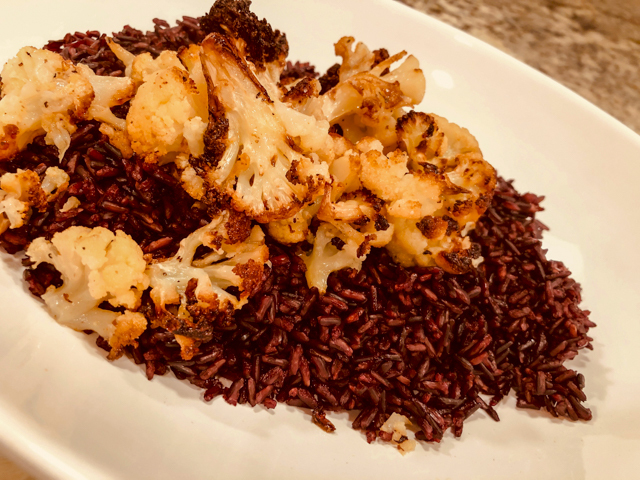 Serve the cauliflower over the hot, steamy rice. Comments: Black rice is very nutritious, high in iron and fiber, its purple color coming from anthocyanins. It is actually the food item with the highest content of this anti-oxidant. Not too shabby, right? If you’ve never tried it, the taste is similar to brown rice, and the texture might resemble a bit wild rice. All that to tell you, Forbidden Rice is not just a pretty face. However, it can be a bit tricky to cook it perfectly. After having a few lousy experiences with it, I have two pieces of advice: soak it for 45 minutes to 1 hour before cooking, rinse well. And use 1 + 3/4 cup of water per cup of rice, not more. Recipes that tell you to use 2:1 will most certainly leave you with a soupy concoction, in which the nice bite of this grain will be compromised. The cauliflower. I got inspiration from a Fine Cooking article on steam-roasted vegetables. 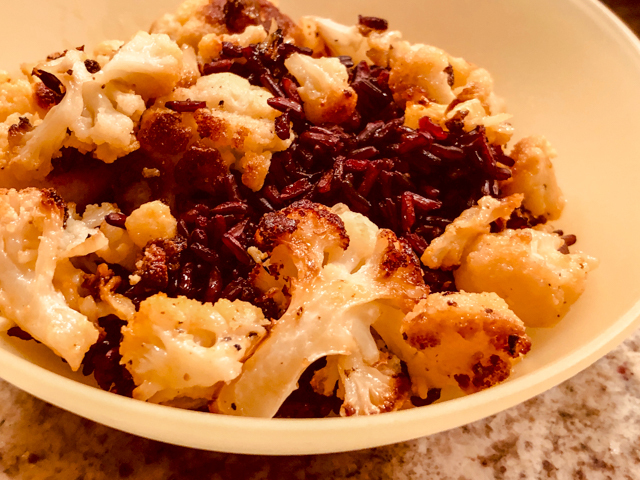 I simplified considerably their take on steam-roasted cauliflower with Indian spices, and shared this stream-lined version with you. 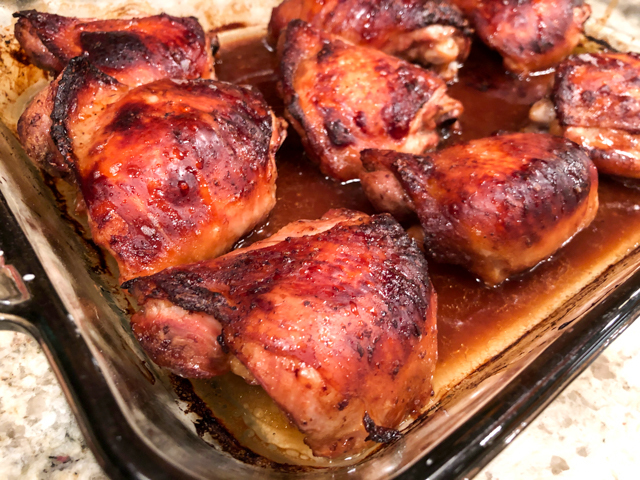 As full-blown omnivores, we paired this side dish with very juicy and very delicious chicken thighs, my default recipe which is on our table every couple of weeks.Yes, it is a lot of chicken, but we got two full dinners out of it, and one lunch for yours truly. For such a simple preparation with humble ingredients, we were quite amazed by how much we enjoyed it. 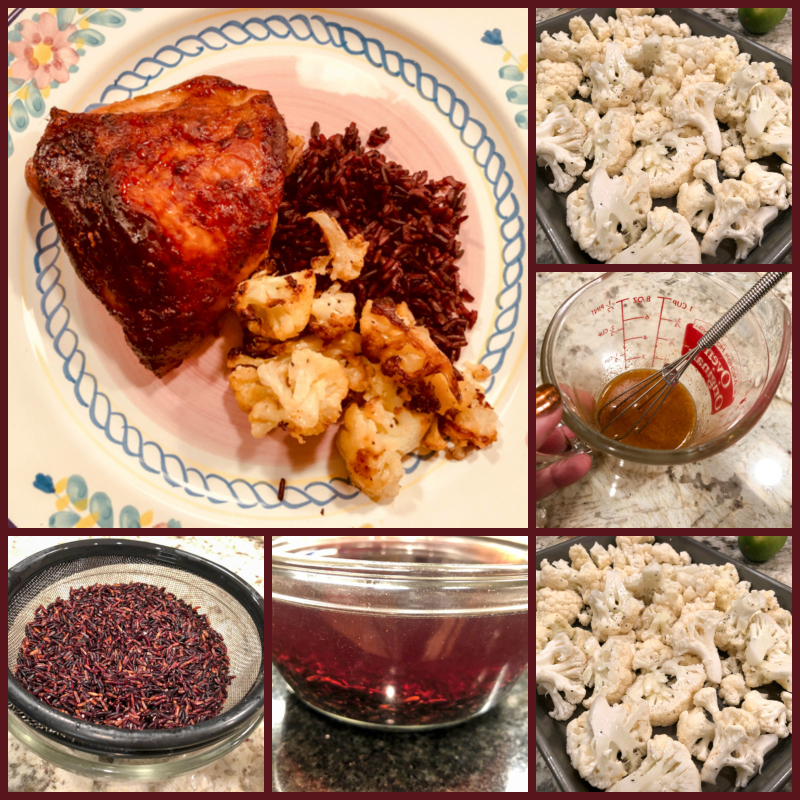 Once the weather warms up (and I turn into a cheerful human being again instead of The Resident Curmudgeon) I intend to make black rice salad, because it seems to me it might be a real winner also.